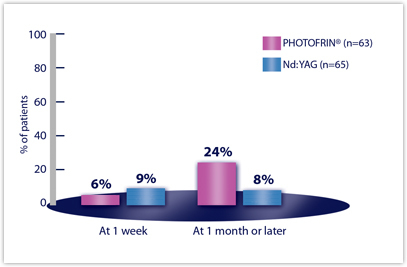 PHOTOFRIN® is indicated for the reduction of obstruction and palliation of symptoms in patients with completely or partially obstructing endobronchial NSCLC. Potential patient types include those with an obstructing lesion in an area that is accessible to bronchoscopy. CR+PR where CR = complete response (absence of bronchoscopically visible tumor) and PR = partial response (increase of >=50% in the smallest luminal diameter; or any appearance of a lumen for completely obstructing tumors). 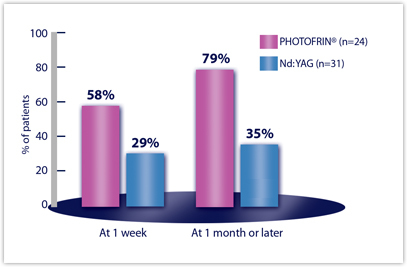 Note: Data based on 2 randomized multicenter Phase III studies that compared the safety and efficacy of PHOTOFRIN® PDT versus Nd:YAG laser therapy for reduction of obstruction and palliation of symptomatic patients with partially or completely obstructing endobronchial non-small-cell lung cancer. 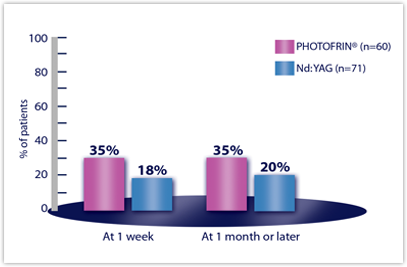 A course of PDT therapy consisted of one injection of PHOTOFRIN® (2 mg/kg administered as a slow intravenous injection over 3 to 5 minutes) followed by up to 2 non-thermal applications of 630 nm laser light. Light doses of 200 J/cm of diffuser length were used. Primary measures of efficacy were objective tumor response and improvement in atelectasis in patients with atelectasis at baseline. Assessments were made at Week 1 and at monthly intervals after treatment. 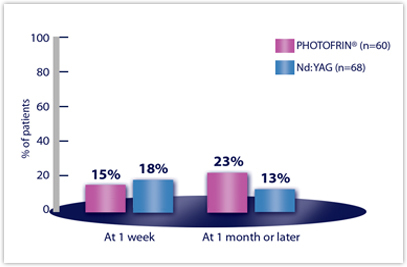 This graph shows the results from all randomized patients in the two studies combined (PDT group: N=102; Nd:YAG group: N=109). 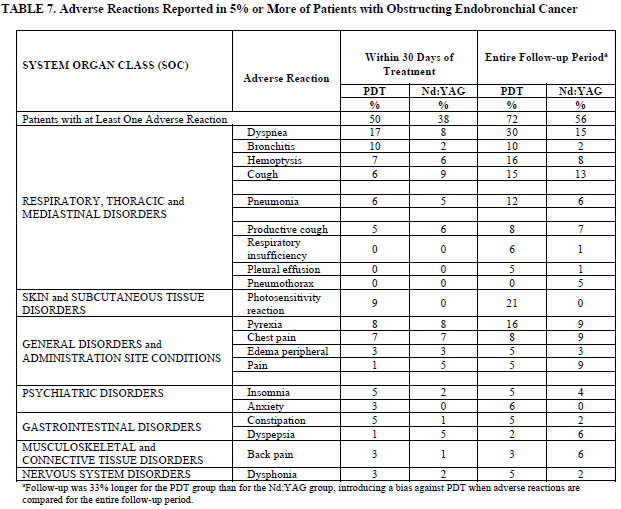 Objective tumor response rates were: 59% for PDT and 58% for Nd:YAG at Week 1; 60% for PDT and 41% for Nd:YAG at Month 1 or later. Patients with moderate to severe symptoms at baseline. §Graded on a 5-point severity rating scale. Clinically significant symptom improvement was defined as a change of =/> 2 grades from baseline. §Graded on a 5-point severity rating scale. Clinically significant symptom improvement was defined as a change of ≥2 grades from baseline. §Clinically significant symptom improvement was defined as a change of ≥2 grades from baseline. 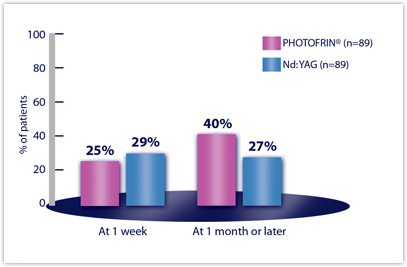 Note: Data based on two randomized multicenter Phase III studies that compared the safety and efficacy of PHOTOFRIN® PDT versus Nd:YAG laser therapy for reduction of obstruction and palliation of symptomatic patients with partially or completely obstructing endobronchial non-small-cell lung cancer. 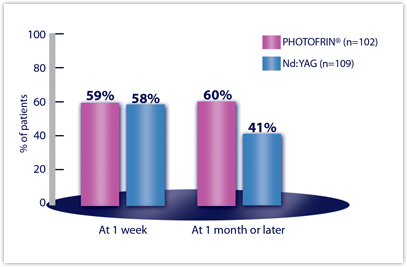 A course of PDT therapy consisted of one injection of PHOTOFRIN® (2 mg/kg administered as a slow intravenous injection over 3 to 5 minutes) followed by up to 2 non-thermal applications of 630 nm laser light. Light doses of 200 J/cm of diffuser length were used. Primary measures of efficacy were objective tumor response and improvement in atelectasis in patients with atelectasis at baseline. Assessments were made at Week 1 and at monthly intervals after treatment. †Statistical comparisons were precluded by the amount of missing data at Month 1 or later. There was a trend toward a higher rate of fatal massive hemoptysis (FMH) occurring on the PDT arm (10%) versus the Nd:YAG arm (5%), however, the rate of FMH occurring within 30 days of treatment was the same for PDT and Nd:YAG (4% total events, 3% treatment-associated events).